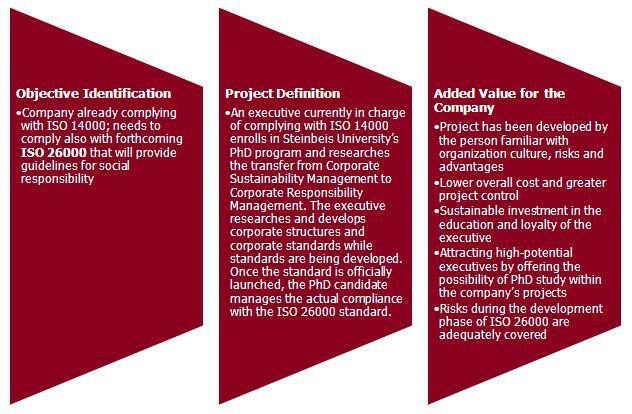 The core principle of every academic program at Steinbeis University Berlin is the Project Competence Concept, which refers to projects taken on by each student that integrate knowledge gained through the study program with application in the workplace. Graduates of Steinbeis University are distinguished by their professional skills and research abilities. The process of undertaking a practical project, together with their theoretical studies, greatly enhances our students’ development into responsible leaders, as they learn to apply their new knowledge and skills to real business problems in their everyday work. As well as contributing to the personal development of our students, these study projects also provide companies with benefits including access to the latest trends in the area of responsible management through knowledge transfer and complete project solutions for real-world problems within their companies. Project supervision (coaching) is given by the assigned project tutor from the Institute and if possible also from the organization where the study project is implemented.